You can reach us by phone or by mail. Whether you are on a business trip or on vacation, relax or explore: The Hotel Dillinger Hof is your address for a pleasant time. As our guest you will enjoy all of the conveniences of a hotel keeping with time: from comfortably furnished rooms to the always attentive service team considerate of your wellness at all times. This is what we stand for with our many years of experience and our tradition. The „Hotel Dillinger Hof“ is located centrally, close to the city centre and the most important enterprises of the region. The house was renovated only in 2006 and offers 47 guest rooms shining in new splendour and a modern glass elevator since then, providing for even more comfort. The guest rooms and the apartment will welcome you in a particularly classy atmosphere. Furnished with care and a sense for the needs or our guests. All rooms are equipped with a shower and a bath tub, hair dryer, minibar, TV, telephone, internet access via wi-fi, and a work area including a desk. It is only a few steps from the hotel to the restaurant „Grillroom im Dillinger Hof“. There, you will enjoy not only Italian, but also international specialities. The friendly restaurant team knows exactly what you wish and offers delicious meals à la carte for lunch and dinner. The Hotel is also an ideal starting point for pleasure trips within the region. Whether you wish to explore Legoland Germany or the various castles – there is a suitable holiday adventure for all ages. Above that, Dillingen an der Donau is popular as an excellent starting point for business trips, bicycle and hiking tours. 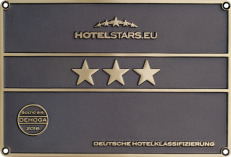 Our Hotel has received 3 stars via DEHOGA classification.